Regretfully, we have cancelled the 2019 Verde River Runoff. First and foremost in this decision is the safety of all event participants including boaters, guides, and volunteers. Due to extreme flows on the Verde River since the beginning of 2019, the high flows and continuing fluctuations have made it impossible to ensure that the race course would be clear and safe for our 150 boaters. We consult with our partners at the Coconino and Prescott National Forests and Copper Canyon Fire Department to ensure that our race course is safe and fun for all level of boaters. We have already started planning for the 2020 Verde River Runoff to be held on Saturday, March 21, 2020. All registered participants will receive a full refund. 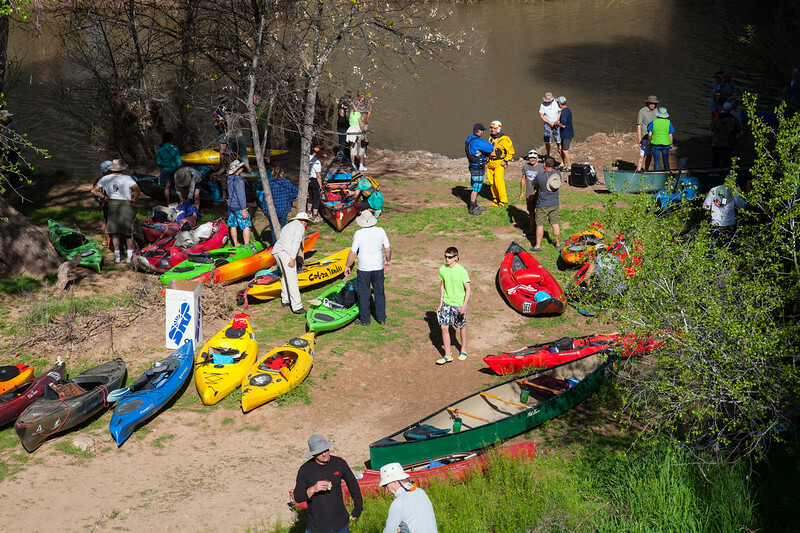 Friends of the Verde River presents the 7th Annual Verde River Runoff on Saturday, March 16th, 2019 in Camp Verde. This 5 and 10-mile kayak, canoe and stand-up boarder race is a popular event that draws novice and seasoned paddlers alike. Participants select from multiple entry categories to challenge every type of boater with trained safety personnel stationed at hazard locations. The 10-mile race is a competitive event with the addition of a 5-mile fun float, this family-friendly celebration of nature and boating provides a great river experience during prime season for river running in the Verde Valley. The course winds its way through mostly Forest Service lands set against the picturesque backdrop of white gypsum cliffs of Camp Verde. The 10-mile race starts at White Bridge and the 5-mile at the River Access at Clear Creek. Both races end at Beasley Flats. The river has a nice current with Class I-II rapids making this an adventure for all. The after-party and awards presentation ceremony are held in conjunction with the Camp Verde Spring Heritage Pecan & Wine Festival. Besides being a lot of fun, proceeds go to conservation efforts for the threatened Verde River and outdoor recreation in the Verde Valley. Registration fees: $25/Fun Float, $50/10 Mile Race. Awards were presented at the Spring Heritage Pecan & Wine Festival in Camp Verde after the race for 1st, 2nd, and 3rd place in the categories listed below. Location: Boater check in begins at 7am at White Bridge River Access Point in Camp Verde, just off of Highway 260. This is also the starting point for the 10-mile race. The end of the race is at Beasley Flat, a U.S. Forest Service Recreation Area. The 5-mile race starting point is located at the Clear Creek RAP. The river difficulty is class I-II. This event is made possible through a special use permit from the Prescott National Forest. Race start time: Starts will begin at 10 am, and should be completed no later than 3pm. roadside parking near White Bridge. Shuttles will be provided from Beasley Flat to starting locations. The River difficulty is class 1-11. Participants must be 12 years of age or older. Any paddler under the age of 18 must be accompanied by an adult. 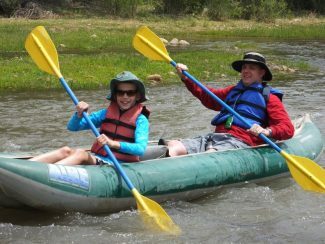 Our Safety Team is comprised of local paddlers with varying backgrounds, from professional rescuers to seasoned river enthusiasts, all with extensive knowledge of the Verde River. With varying backgrounds and skills, the Team trains together before each season’s event, and are able to combine the techniques to create a comprehensive and solid Safety Set Up for the Race! Click the links below for additional information. Need to rent a boat? Click here to rent a single or tandem inflatable kayak. Verde River Runoff Awards are presented at the Spring Heritage Pecan & Wine Festival after the race. Spring Heritage Pecan & Wine Festival is a two-day festival celebrating the springtime beauty of Northern Arizona, the Verde Valley’s rich Native American history, the largest original historic fort in Arizona, and the one-of-a-kind Wild & Scenic Verde River–the last river in Arizona to flow year-round for its entire length. This event is for all-ages, with live music, 40 vendors, and activities for kids on the Community Field, in Camp Verde’s historic downtown. Enjoy this video of the 2016 Verde River Runoff by Critical Eye Photography – Doug Von Gausig. Click on the links below for a pdf on all race results.